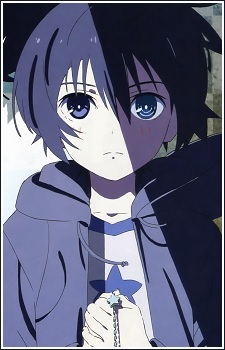 Kuroi Mato is a black-haired school girl with blue eyes. She likes playing Basketball. She takes an interest in, and speaks to a girl she sees the first day, Takanashi Yomi. They became the best friends. Mato is a black-haired school girl with blue eyes. She has short, choppy pig tails and wears a seifuku consisting of a white top with a dark blue collar and a dark blue skirt. She also wears black knee-high socks. She is also seen to have a patch of bandage on her right knee, after obtaining an injury from basketball practice. Many of her belongings, including her clothes, phone charm, and room decorations, have a star motif. She is an innocent and naive first year student in middle school. Outwardly, she is outgoing and excitable, but she is very awkward around people she does not know. Internally, she is sensitive and meek, but eventually learns to gain courage. Mato retains most of her appearance from the OVA, aside from wearing a different, non-seifuku school uniform. The patch of bandage on her right knee is gone, though she now has a bandaid on her right thigh. She is fond of philosophical musings, and often will vaguely say something that she sees (for instance, remarking "blooming" when seeing a patch of flowers) to no one in particular. Saya also describes her as the kind of person who has, until now, never hated anyone or have anyone hate her. Her favorite food is said to be curry. She is very fond of the book "Li'l Bird Li'l Bird Colorful Colors" and reads it repeatedly. Love, pain, friendship, and sacrifice. These are just a few of the many emotions and themes found in the brilliant story of Black Rock Shooter. Let's look at some of the deep and memorable quotes that make the series so good.